It’s that time of year again – cold & flu season. With holiday parties starting soon, it’s not a good time of year to be sick. Actually, it’s never a good time to be sick! A cold or flu can sneak up on you quickly so it’s good to prepare yourself before you’re exposed to the germs. Some ways to reduce your chances of getting sick this cold & flu season include eating a healthy balanced diet, washing hands regularly, getting adequate sleep each night and getting your flu shot. This Immunity-Boosting Salad recipe is packed with vitamins and nutrients to help you stay feeling your best. 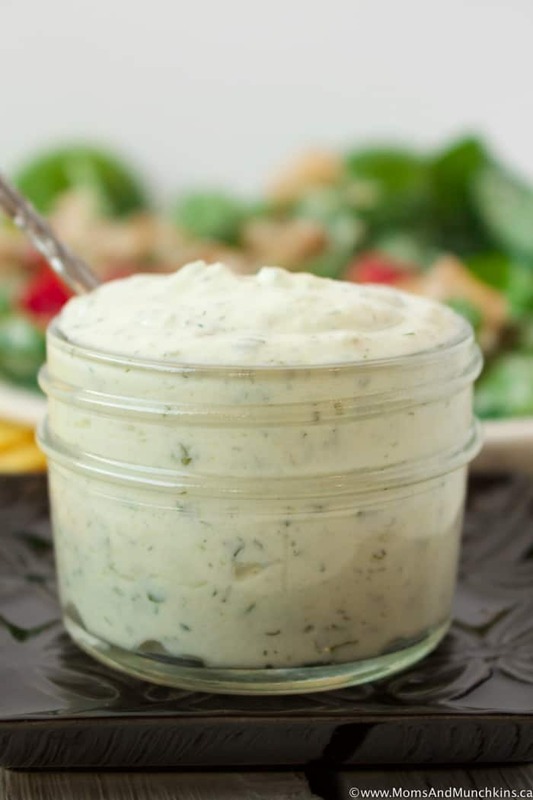 It includes a homemade Creamy Lime Greek Yogurt Dressing that’s really easy to prepare. 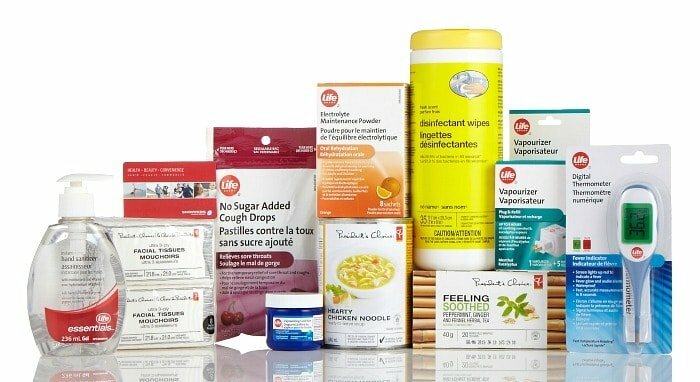 Do you know that you can receive your flu vaccination from Shoppers Drug Mart pharmacies? An injection-certified pharmacist administers these vaccines at all hours, without an appointment, just walk-in. That’s a lot more convenient than waiting in line at a flu clinic or your doctor’s office. Fall is the best time to get vaccinated since the vaccination may take two weeks to take effect. 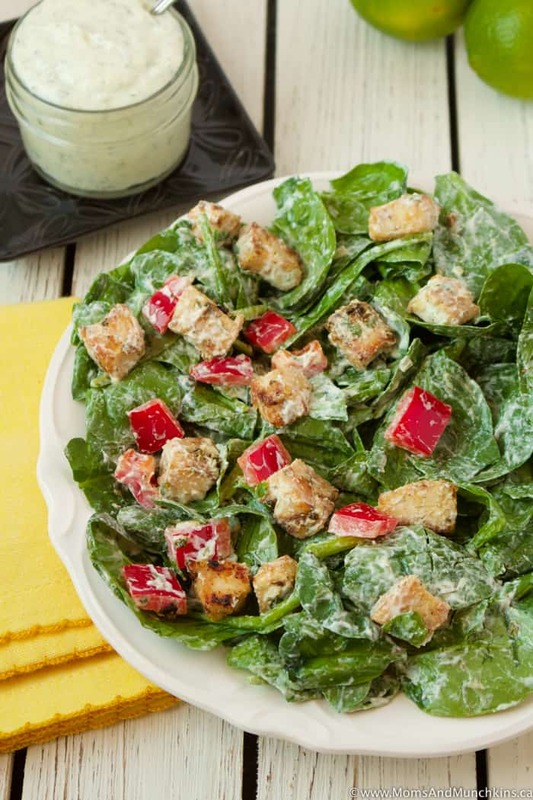 You’ll want to make the salad dressing the evening before (or at least 5 hours before meal time) so the flavours have time to combine together properly. In a medium sealable food storage container, combine all dressing ingredients and stir well to mix. Place lid on container and place this in the fridge for at least 5 hours (preferably overnight) so flavours have time to combine. In a large frying pan, cook chicken with oil and garlic until chicken is thoroughly cooked. Set aside. 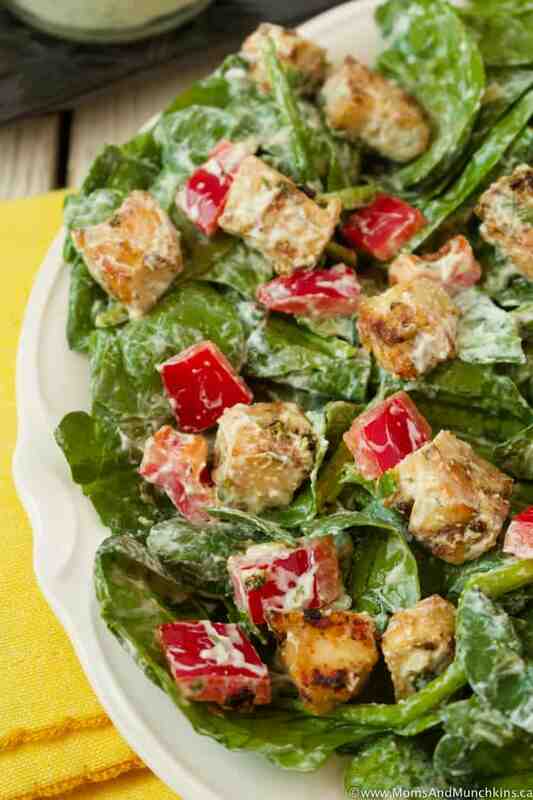 In a large bowl, combine spinach, red peppers and cooked chicken then toss with dressing. This is a very thick dressing so start with a couple of tablespoons then add more to your preference. This giveaway is open to Canadian (excluding Quebec) residents only who are at least 18 years of age. Giveaways are void where prohibited by law. The giveaway ends November 15th, 2017 at 11:59pm. A winner will be drawn randomly within 24 hours of the end of the giveaway. The winner will be notified, by email, and will have 48 hours to claim the prize & answer a skill-testing question. If I do not receive a response from the winner within 48 hours, a prize forfeit will be assumed and a new winner will be chosen randomly. We protect against the flu by getting the flu shot, washing our hands frequently and eating well. We take multi-vitamins, echinacea, Vit C, wash our hands. Wipe down common surfaces every other day with Lysol wipes. I KEEP HEALTHY BY EATING NUTRIENT DENSE FOOD, EXERCISING, AND CONTINUOUS HAND WASHING. I wash my hands frequently… also better eating habits, fruits and veggies.. Self care. Thx so much for the opportunity to win such an amazing prize! I get my flu shot every year and take a daily vitamin. I try hard to avoid germs, but sometimes it can’t be helped, and you get sick anyway. Have started using my steamer to disinfect all surfaces in my home. This salad looks so healthy and delicious. Going to give it a try. i didnt do anything to prevent the flu this year. Ive had it for two weeks so far. Arrrg!